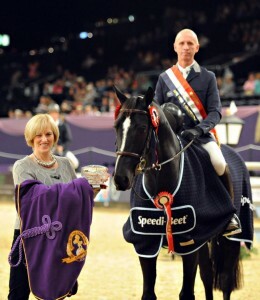 “Liz Hesketh of British Horse Feeds crowns Tim Davies and Allure III the 2012 Speedi-Beet HOYS Grade C Champions. 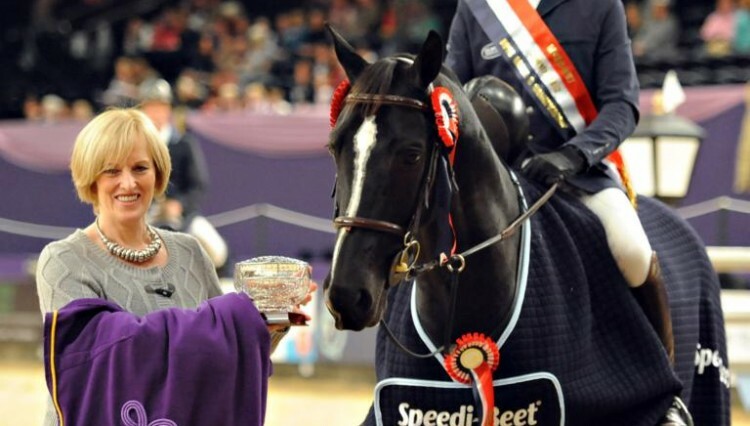 The Speedi-Beet Horse of the Year Show (HOYS) Grade C Championship provided spectators with one of the most exciting finales of the show. Twelve horses made it through to the jump off but it was Tim Davies and Allure III that secured the top spot with a jump-off time of 35.86 seconds. Competition was tough with less than a second separating the top five riders. Paul Barker and eight-year-old gelding Townhead Zanzibar finished in second place, just 0.7 seconds behind Tim, with Graham Lovegrove and Alfie 192 in third place on 36.06 seconds. Based near Bury St Edmunds, Tim took the ride on the seven-year-old KWPN gelding Allure III for owner Jessica Tillett, when he proved to be sharp as a youngster. Said Tim: “I had to win and really didn’t want to end up just missing out. I would rather have had a fence down and finish way down the line than be second or third. “It’s my first win at HOYS, so I finally got to gallop under the spotlight out of the arena. The atmosphere is fantastic – it really boosts you”. Liz Hesketh of British Horse Feeds, makers of Speedi-Beet, thoroughly enjoyed the championship: “The class was exhilarating and had us all on the edge of our seats. 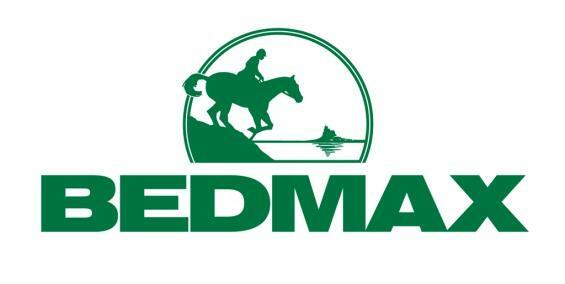 It was fantastic to see so many talented horse and rider combinations battle it out for first place.” Speedi-Beet is a high fibre quick-soaking beet pulp feed which is ideal for performance horses as it provides energy but is low in starch and sugar. Ready to use in just ten minutes, the feed is economical and easy to prepare.